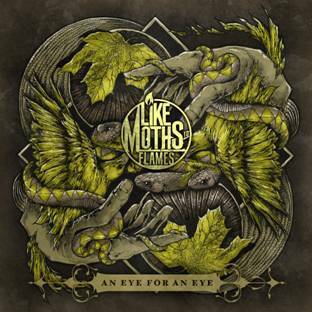 An Eye For An Eye upholds Like Moths To Flames’ notoriously aggressive energy while revealing the band’s most exciting and heavy-hitting work to date. The new album showcases maturing song structures leading with sleek guitar melodies rolling into robust riffs that compliment Roetter’s signature raw textured vocals and merciless lyrics. Guest vocalists Shane Told of Silverstein on “Into The Ground” and Ahren Stringer of The Amity Affliction on “Lord of Bones” also add to the evolving dynamic of the album that sets it apart from previous releases.